Could you suggest the best medium for potted bulbs I can stand outside in protective situation. I would suggest using John Innes No. 3 with plenty of sand or grit for the drainage. This entry was posted in Eucomis, FAQ, Newsletter and tagged Bulbs, Care, EUcomis, Winter on October 18, 2017 by Gary Milne. Yes Angel’s Wish is a good choice to flower at the same time as Queen of Night Tulips. This entry was posted in FAQ, Newsletter, Spring Bulbs, Spring flowers, tulips and tagged angels wish, Bulbs, queen of night, Tulips on September 19, 2017 by Gary Milne. Some tips for our Lily Lovers! Hopefully everyone has had beautiful lilies this year in their garden. 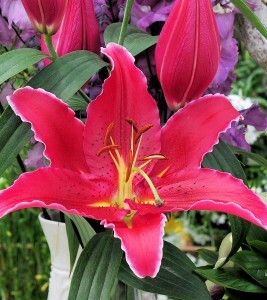 The ‘Tree-like lilies‘ have been fantastic, there are so many new varieties. The perfume is wonderful. These extremely tall lilies tower above the shrubs in borders with sturdy stems and an abundance of blooms. So, if your lilies have bloomed, now is the time to dead head them. Cut just below the last bloom leaving the stem to die back completely, this feeds the bulb for the following year making the bulb bigger, producing more blooms. Wait until the autumn to repot. Lilies should be re potted every three years. The little bulblets you find can also be potted to produce blooms in a few years time! Remember to keep your lilies well drained over winter. This is really important or they will rot. Tip pots on their side or place them on a couple of house bricks. 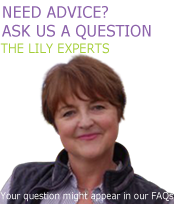 We have more tips on planting and looking after your lilies here including how to keep those pesky Lily Beetles away! We have some fabulous new varieties for next year, especially ‘Roselilies‘. These beautiful double varieties are highly scented and have no pollen. They will soon be added to our website, so please check back and order for February delivery. some stunning varieties of Tulips but if you want height, Alliums are a must! Lastly we are at the ‘Shrewsbury Flower Show‘ this weekend (Friday 12th to Saturday 13th August). So if you are coming, we will see you there! This entry was posted in Spring flowers and tagged Alliums, Bulbs, Flower shows, garden, garden flowers, HARTSNURSERY, Lilies, lily bulbs, Spring Bulbs, Tall flowers, Tulips on August 12, 2016 by Harts Nursery. That’s right, we are back travelling the UK for the show season. We have already been to Wisley and Suffolk this year and next week we are off to Cardiff for the RHS Flower Show Cardiff. The shows are a great day out with plenty of things to see, places to eat and of course, to purchase all your gardening needs. 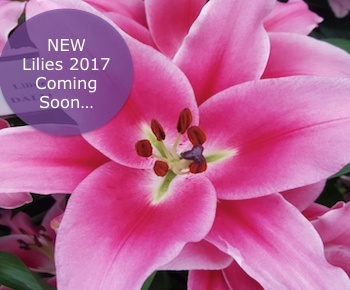 We will be exhibiting our display of Lilies at many of the shows and you can purchase our Lily bulbs from our ‘pick n mix’ style of shop. Look out for our show offers!! We will also have many other favourite Summer flowering and Spring flowering bulbs available including some unusual varieties. See you at the shows!! Click here to see some of the shows will be exhibiting at this year. This entry was posted in Flower Shows, Lily Bulbs, Spring Bulbs, Spring flowers, Summer flowers, Uncategorized and tagged Bulbs, Flower shows, garden, garden flowers, Lilies, lily bulbs, perennial, Spring Bulbs, Summer bulbs on April 5, 2016 by Harts Nursery. 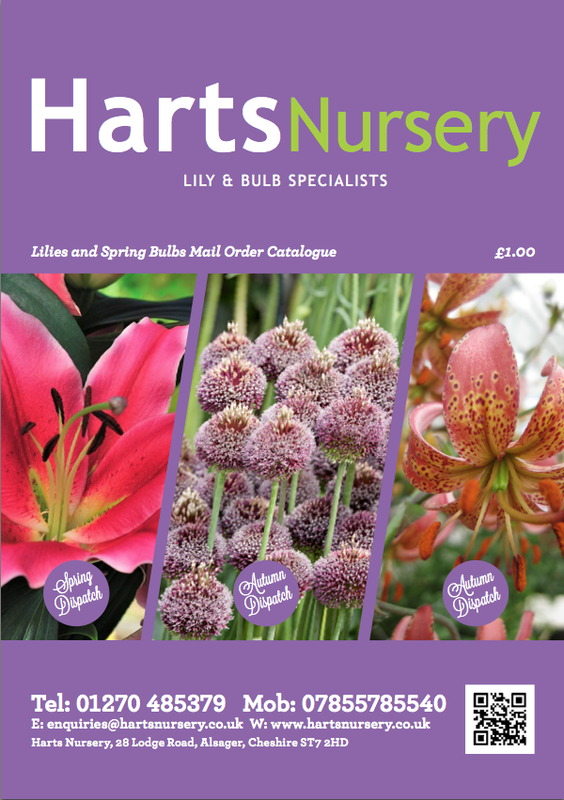 You can now download our 2016 Lily and Spring Bulb Catalogue (as a PDF) so you can browse our varieties in comfort before ordering online at www.hartsnursery.co.uk or by post/telephone. We have plenty of Lilies, Martagons and other Spring and Summer flowering bulbs for a garden full of colour year after year. If you find it easier, please feel free to print off the downloadable Catalogue below and complete the order form on the inside back page and send it to us by post along with your payment. We accept payment by Card over the phone, Paypal or Cheque. 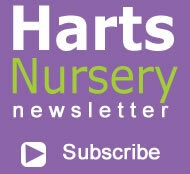 Please contact us on 07855785540 or email us at enquiries@hartsnursery.co.uk if you have any questions. This entry was posted in alliums, Begonias, Catalogue, Lily Bulbs, Spring Bulbs, Spring flowers, tulips and tagged Alliums, Bulbs, Daffodils, garden, HARTSNURSERY, Lilies, lily bulbs, perennial, Red Mohican, Spring Bulbs, Summer Flower Bulbs, Summer Garden, Tulips on March 8, 2016 by Harts Nursery. We were fortunate enough to have a professional team from Zumm Creative come over to the RHS Tatton Park Flower Show this year and capture some great footage of our lily display and outside Garden where we won a Gold Medal for our lilies and Best Plant Village Exhibit for our garden. Well done to all – it looks great! please contact Calam Smail on 01270 897170. 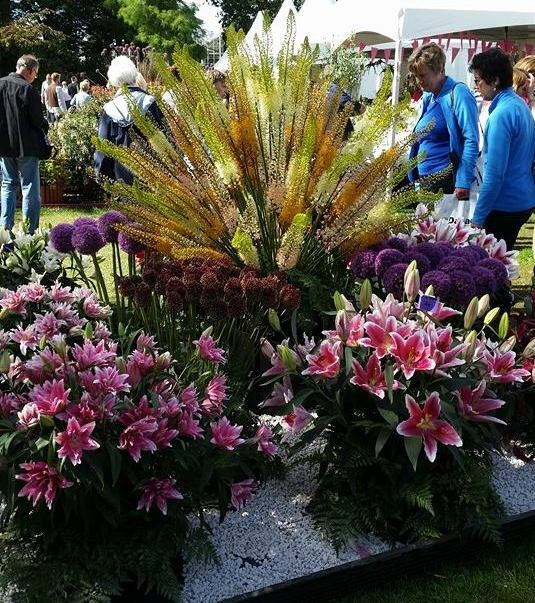 This entry was posted in alliums, Flower Shows, Lily Bulbs and tagged Alliums, Bulbs, Colourful flowers, Eremurus, Flower shows, HARTSNURSERY, Lilies, RHS Tatton Park Flower Show, Summer flowers, Zumm Creative on September 19, 2015 by Harts Nursery. 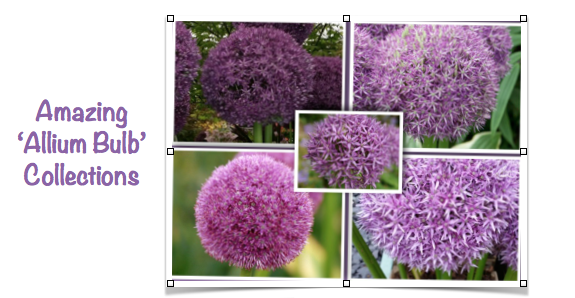 Giant Allium Bulb Collection with 10 FREE Purple Sensation! Following the increase in popularity this year, we have a great new offer on Allium bulbs for you! If you love the tall, majestic appearance of the giant alliums, then this collection is for you… Alliums (also known as Ornamental Onions) are perennial flowers that stand very tall, towering over your other flowers. They are often described as lollipops or fireworks due to their spherical appearance. Alliums should be planted in the Autumn for later Spring flowering and are a real show stopper for your garden. They are ideal for full sun or partial shade and create a great feature whatever the location. Delivery will be in September 2015 ready for planting so why not order yours today to avoid disappointment? 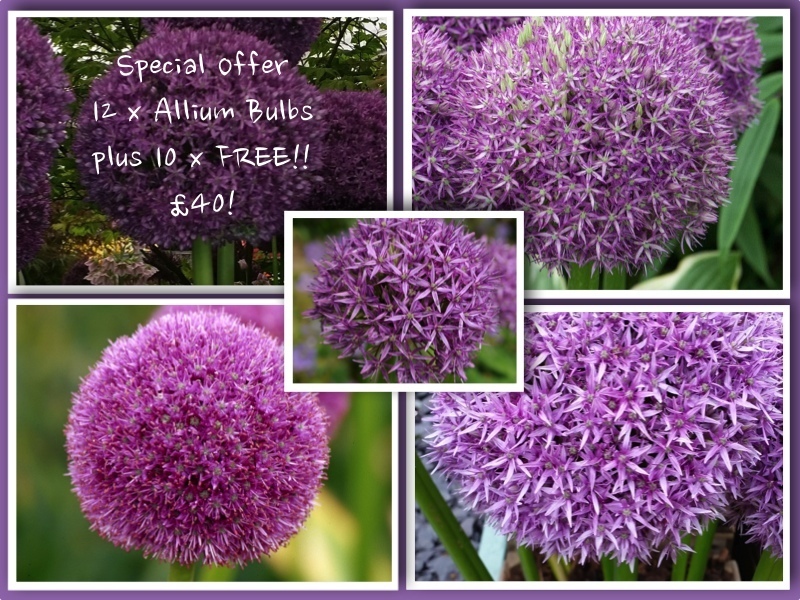 SPECIAL OFFER – 12 x Allium Bulbs (3 x of each variety) PLUS 10 x FREE Purple Sensation Bulbs!! with 10 x FREE Purple Sensation Allium Bulbs! Pack of 22 x Bulbs in total! This entry was posted in Newsletter and tagged Alliums, Bulbs, garden flowers, Plant now, pom-pom shape flowers, purple, Spring Bulbs, SPring Garden, Tall flowers on August 31, 2015 by Harts Nursery. You may be thinking that Summer has only just arrived and we really haven’t seen much of it so far. But unfortunately, Autumn will be upon us before we know it and that’s when you need to start thinking about your garden for the following Spring… Yes! I said Spring, 2016!! Seems a long way off but if you want your garden to look full of colour and packed with your favourite flowers then thinking ahead and planting your bulbs in the Autumn is what you need to do. If you’re not an experienced gardener, that’s not a problem as we provide growing and planting instructions on most varieties on our website at www.hartsnursery.co.uk. Have you thought about your colour scheme for your garden or the height of the flower s you would like? Or do you need to know what flowers grow best in what conditions? Some prefer sunnier positions and some like growing in the shade. Perhaps your garden has an Alkaline or Acidic Soil? If so, our website can advise on this or you can just drop us an email at info@hartsnursery.co.uk and ask us! We are happy to help! We have some great offers on Spring bulbs this year with many new collections being added to our website to make the decision-making easier. We’ve grouped certain varieties together based on what we think complement each other at a special offer price! Check out our fabulous offers on Alliums too!! It seems these majestic, pom-pom like flowers are not only attracting the bees as we’ve noticed that Alliums have been super popular this year! There’s plenty of new varieties for you to choose from. 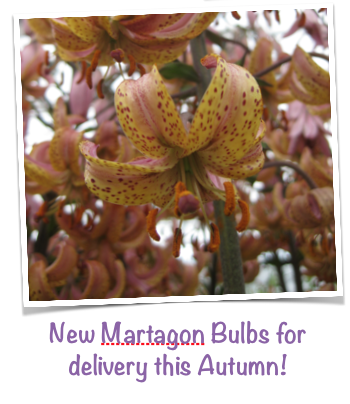 Autu mn is also the time to plant your Martagon Lily Bulbs. Now, these spectacular species grow well in woodl and type gardens and especially well in dappled shade in a humus-rich, Alkaline soil. Another great feature about these Lilies is that they naturalize really well and are long-lived and particularly hardy! 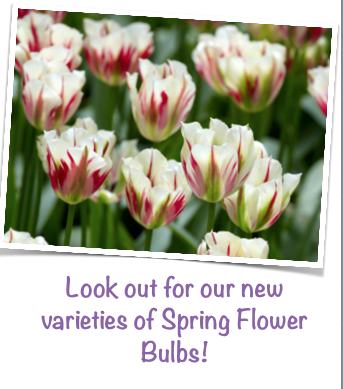 Again, we have some amazing new varieties for you to choose from on our website. Order now to avoid disappointment as we have limited stock! This entry was posted in alliums, Newsletter, Offer, Spring flowers, tulips and tagged Alliums, Bulbs, Daffodils, Lilies, lily bulbs, offer, Tulips on August 12, 2015 by Harts Nursery. Now Spring is well under way and we approach our ever anticipated Summer, please do not think it’s too late to plant lilies for flowering this year. I know that many of your lilies will have some nice growth on already but lilies planted now will show in as early as 12 weeks with the same fantastic results as planting in early Spring. Lilium Oriental Red Empire has become very popular with our customers in the past couple of weeks, what a statement it would make in any Summer garden. This entry was posted in Lily Bulbs and tagged Bulbs, Lilies, Lily, Oriental Lily, Red Empire, Summer Flowering on April 30, 2015 by Harts Nursery.